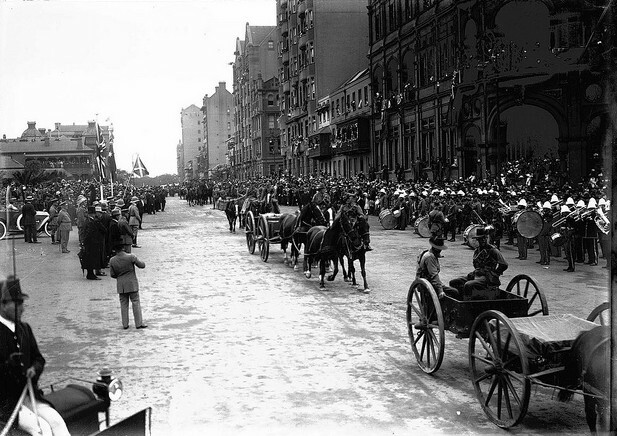 Australian Light Horse saluting the Governor-General and riding along Macquarie Street in Sydney, 24 April 1915. 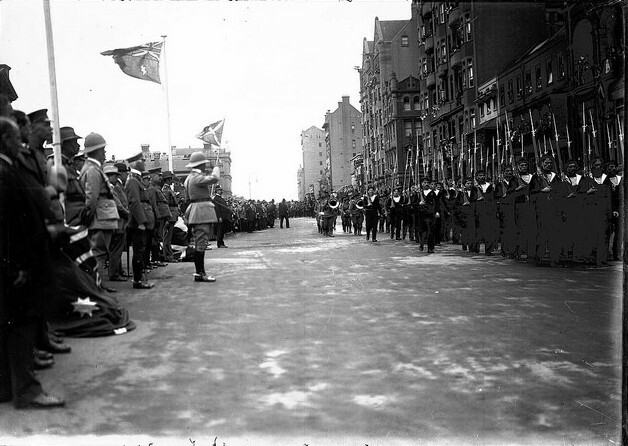 At about 2pm on 24 April 1915, 5,000 Australian troops marched through streets of Sydney. Symbolising the ‘State’s official farewell to the troops’, it wasn’t until a few months later that they finally embarked for war. On this day, 99 years ago, over 200,000 people flocked to the city to bid farewell and a safe return to ‘Our Boys in Blue’ and ‘The Khaki Men‘. It was a goodbye seemingly unaware of the horror that would unfold the following day – the day Australian and New Zealand forces commenced a devastating 8-month conflict; the day they landed at what is now known as ANZAC Cove. 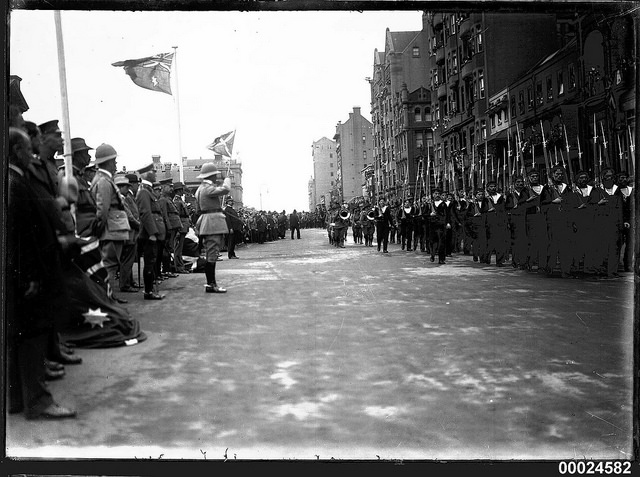 As I walk Sydney’s streets today, it is difficult to imagine what it may have looked like almost a hundred years ago as crowds crammed into every vantage point to catch a glimpse of the passing men in uniform. Photographer Samuel J Hood, now famous for his spectacular portraits of Sydney life, was probably accompanied by a team of photographers scattered at various key locations for the best shot. But though his black and white negatives provide a fantastic visual representation, they convey little of the colours and sounds that must have permeated the streets. One who was pushing very vigorously with his back so irritated a middle aged lady that she prodded him somewhere with a hatpin, and he jumped as though he had struck a bullet, and the line was temporarily broken. However, the utmost good humour prevailed. The grand parade passes the Mitchell Library and the Royal Botanic Gardens. And it seems this ‘good humour’ continued as it turned into quite the spectacle. A ‘stout hatless woman…got so excited when the troops passed that she rushed out and kissed several of them promiscuously to the huge delight of the spectators.’ Picture the line of the march as it ‘glowed with an efflorescence of gaily-coloured flags’ including the ‘six-star spangled Commonwealth emblem dominating, alongside the French and Belgian tricolours’ and ‘Rising Star of Japan’. Then the weather threatened to dampen the parade. Rain suddenly poured and according to the Sydney Morning Herald ‘the whole of Elizabeth street and Belmore Park looked as if it had sprouted a crop of enormous black mushrooms, so thickly and so quickly did the umbrellas go up.’ However, the shower ceased and ‘Umbrellas were folded up again, and the dead black became two lines of stationary variegated colours, cut in half by the slowly moving line of khaki, tipped with glittering steel.’ I can just imagine, Hood and his fellow photographers must have breathed a sigh of relief, as umbrellas no longer obscured the spectacle. The horsemen bestrode their steeds as if part and parcel of them, and the bronzed and stalwart infantry were such as were calculated to delight the heart of a General. As they passed the Royal Botanic Gardens, their heads were turned to their right in salute of the Governor-General, Sir Ronald Munro Ferguson. Imagine the sound of horses’ hooves and heavy boots combined with multiple bands playing a range of stirring tunes with ‘great zest and frequency’. One song, ‘It’s a long way to Tipperary’ (1912), was played and sung throughout the parade, standing out as a firm favourite in particular among the 10,000 children assembled in Hyde Park. At some point quite suddenly, the band opposite the Governor-General ceased playing ‘Tipperary’ and began ‘The Marsellaise’. Lieutenant Coustolle and his 50 men of the French Naval Brigade had reached the scene. The long bayonets on their rifles gleamed as one lady exclaimed: ‘“What lovely caps!”…referring, of course, to the scarlet pom-poms on the tops. “Yes,” replied her chum, “But look at the officer; I’d love to have those gold things on his shoulders!”’ There was also much talk about the travelling kitchen as the ‘unpicturesque, but indispensable adjunct of an army on the move’. In what sounds like a familiar picture, as the parade drew to a close, Sydney’s trams, trains and ferries were once again overwhelmed with the thousands of passengers eager to funnel out of the CBD. 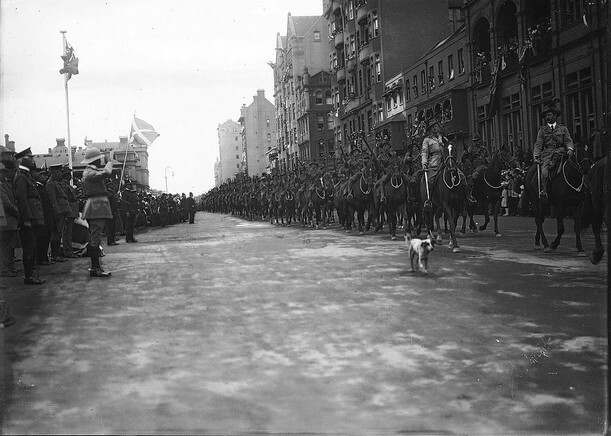 It seems fitting that we mark today, the day before the city’s ANZAC Day March in the first year of the centenary of the First World War, with a look back 99 years ago at how Sydney’s streets were lined with people cheering for a very different purpose – for the ‘March of the Gallant Five Thousand’. NOTE: This piece was originally published on the Australian National Maritime Museum blog on 24 April 2014. Reproduced courtesy of the Australian National Maritime Museum.